A week ago, I finally gave in an bought a Ninja. I got the Kitchen ProSystem 1100 . I had been wanting it for a couple years ever since I saw the commercials for it. One reason was the power is supplies without the price of an expensive machine. We drink a lot of smoothies here, but I also wanted it because we have very little counter space and it promised to do some duties a mixer does such as making cookie dough. I had heard that you could make peanut butter in it, so I decided to give it a go. All the recipes I could find online were not very specific when it came to measurements and from what I could gather, left the peanut butter tasting kind of bland. I spent some time perfecting this recipe so it was flavorful and diabetic friendly and I hope you enjoy it. 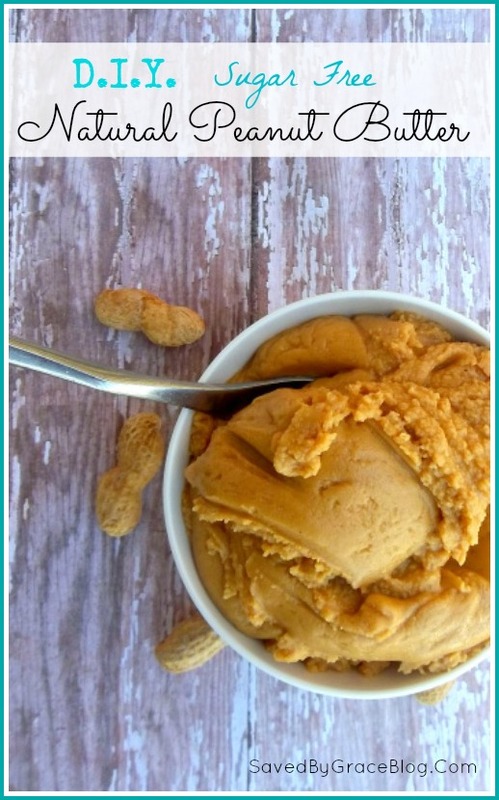 This recipe makes approx 3 cups of peanut butter. Please note, as well, that you can control how crunchy it is. I made mine a creamy version. Place the larger pitcher for your Ninja on the base. Add the blade inside carefully. Pour the peanuts inside the pitcher. Turn the Ninja on to "Ice Crush". Allow to crush for approximately 1 minute. When peanut butter starts to form at the bottom, open the pitcher spout flap and carefully add in the peanut oil. Allow to spin for another 30 seconds and then carefully add the honey and the pinch of salt. Keep the blender on until there is no more peanuts in powder form. Unplug machine and carefully remove blade. Using a spatula, remove peanut butter and add to a container with a lid. **Peanuts can be bought in bulk for lower cost than in containers. i spent around $2.50 for this amount. To make your peanut butter crunchy, don't crush as long. Because this contains no preservatives, it needs to be stored in a container with a lid in the fridge. It will stay good for around 3 months. This post is in NO WAY sponsored by Ninja. I bought and paid for my own machine. I was not asked to write for them or promote them in any way. There was a grocery store when I lived in Washington state that had a make your own nut butter section. There were peanut, almond and cashew options. I never did it because it was far too expensive. I agree it can be expensive that way! This way was not too bad considering the current price of PB these days! WOW! I bet this peanut butter tastes good. But I have one question. Is is okay for a diabetic to eat peanuts out of the shell? I was just wondering. And your peanut butter recipe is great for anyone because it is healthy and nice to know that my Dad can have this.